During the swoon we saw to close out 2018, not to mention parts of January when department store titans like Macy's and Nordstrom gapped down violently, retail stocks suffered a fair amount of damage even compared to other sectors during the correction. However, some intriguing names have been popping up of late, including the likes of Lovesac (LOVE), an underrated furniture retailer. Moreover, the usual suspects have maintained relative strength, including DECK FIVE LULU. Going forward, I want to see whether emerging winners like ETSY can continue to improve. In addition, some hidden gems seem to be out there, such as Boot Barn. 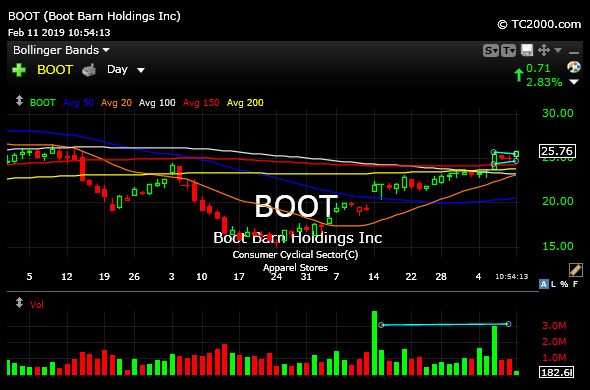 On the BOOT daily chart, below, note the recent spurts of buy volume (bottom pane) to compliment the price move back above all moving averages. The firm has locations in all western and mountain west states, with plenty of room for growth in the populated northeast, making it yet another enticing long in retail, going forward. Recall that most retail plays report earnings at the end of the season. But BOOT reported last week, meaning earnings are out of the way and we can focus on whether the chart keeps improving over the key $27 level, above.